Here is a really good introduction to the way a laser works. 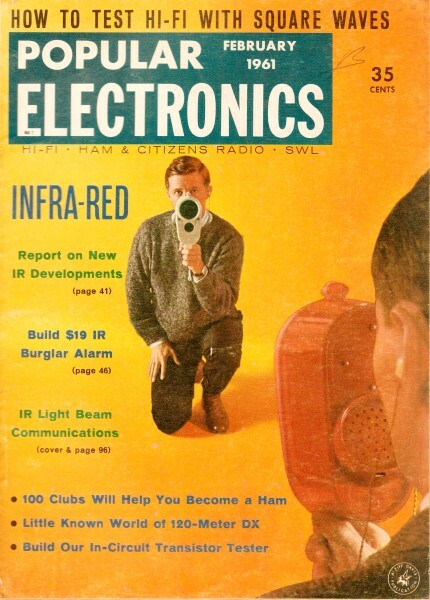 The article talks about a couple Bell Telephone scientists who pioneered long distance laser communications back in 1960. Their experiments began with rather large chemical lasers on the rooftops of buildings separated by 25 miles. We've come a long way since then, with laser communications now taking place within the confines of a semiconductor integrated circuit. One day last September, two Bell Telephone scientists, R. J. Collins and W. S. Boyle, stood on a hill at the company's laboratory in Holmdel, New Jersey. Beside them, mounted on a tripod, was a brass cylinder a little bigger than a flashlight. At a precise moment, one of them touched a button on some nearby electronic equipment. Instantly, a brilliant red flash shot from one end of the cylinder. Two other Bell scientists, D. F. Nelson and W. L. Bond, standing on a rooftop 25 miles away, were able to see the flash with their naked eyes. This accomplishment - transmission and detection of a light flash over a 25-mile distance - seems unremarkable enough. Yet Dr. George Dacey, Bell's Director of Solid State Electronics Research, thought otherwise. 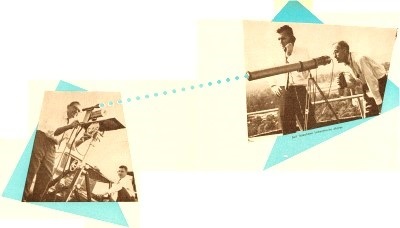 Hearing of the experiment's success, he made a simple but solemn pronouncement: "A new era of communications has begun!" What the Laser Is. The laser, for all its revolutionary properties, actually stems from another development several years old. As you may have noticed, there's a similarity between the words "laser" and "maser," and the similarity is more than coincidence. A laser is simply a maser capable of operating at frequencies within the visible light range. In spite of its tremendous promise, the laser is an extremely simple-looking device. It is nothing more than a cylinder of synthetic ruby about 1/4" in diameter and 1-1/2" long, mounted in the center of a spiral coil of glass. 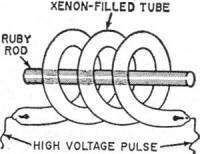 The coil is a xenon-filled flash tube, very much like the ones used by photographers for taking flash pictures. To operate the gadget, scientists send a jolt of current through the gas-filled tube, setting off a brilliant flash of greenish light. The electrons in the ruby absorb this light, and generate energy at another frequency. To put it another way, the ruby absorbs greenish light, only to give off a pure red ray. And the beam produced by this atomic flashlight is capable of performing the feats mentioned earlier - as well as a number of others - because it is unique in several important ways. Let's see just what makes the laser's light so different. A laser is is small rod of synthetic ruby which absorbs light energy at one frequency and emits light at another frequency or color. Its operation depends on the fact that the ruby contains chromium atoms which can be at any one of at least three different energy levels, as illustrated at left. The lowest level - A - represents the area where the atoms will normally be. If. however. a photon of light from outside the system hits one of the chromium atoms, that atom absorbs light energy and is lifted to a more excited stare, represented by level C. Almost immediately, it falls back to level B, giving up a little of the energy absorbed from the photon It remains at level B for a relatively long period, as measured in atomic time - perhaps as much as ten microseconds Eventually, it falls back to level A, and in the process gives up the rest of the energy absorbed from the photon. This emitted energy is in the form of red light. The process described so far is normal fluorescence - just like that which takes place in fluorescent lighting. In the fluorescent bulb, ultraviolet light is used to excite the atoms of fluorescent material, which then give off a white light. But the separate quantities of light given off by the electrons are not in phase. Instead. they are random. or - to use the scientists' word - incoherent; in a way, they are similar to radio noise. The laser, on the other hand, generates a coherent signal - a signal of one frequency, with all electromagnetic light radiation in phase. An intense green light is beamed at the ruby. Thi light "pumps" huge quantities of chromium atoms into energy level C These atoms quickly fall to level B, where they remain for a while. Occasionally, one atom spontaneously fall back to energy level A, emitting red light. But there are so many atoms now at energy level B that the spontaneously emitted light from the atom that falls will almost certainly bump into another chromium atom at level B This collision will cause the second atom to give off its energy in phase with the first atom The energy from the second atom bumps into another atom, and so on. The chain reaction builds rapidly. Because the ends of the rod arc silvered, the emitted light bounces back and forth, stimulating still more atoms to give up their energy. Soon, tremendous quantities of red light are rushing back and forth in the rod like water sloshing back and forth in a bathtub. Finally, it reaches such a level of intensity that it bursts t through one end of the rod (one end has less silver than the other) and shines forth in a brilliant, coherent ray. "Coherent" light. The light generated by the laser is coherent. This means that all its rays are at one frequency. Natural light, in contrast, whether produced by the sun, a light bulb, or a match, is made up of rays of many different colors, or frequencies. Even light sent through a colored filter contains many frequencies, although far fewer than "white" light. Light containing many frequencies is roughly comparable to a completely un-tuned radio signal or a raucous noise. Such a hodgepodge signal is impossible to control effectively. About the only thing you can do to transmit information with such an undisciplined mixture - whether light, radio frequencies or just plain noise - is to turn it on and off to form a simple code. Ships, of course, have been using blinker lights for years. With the laser, we have a coherent light source for the first time. We can control it in the same sophisticated ways we take for granted in radio. In addition, because of the extremely high frequencies at which light is transmitted, we can perform a number of tricks impossible with radio. For example, fantastic amounts of information can be packed into one light beam. With such a system, we may some day transmit thousands of television signals and hundreds of thousands of telephone, teletype, and telegraph signals on a single laser beam! In addition, the laser, by operating in the visible light spectrum, vastly increases the number of useful frequencies we can put to work. Heretofore, we have been able to use frequencies up to about 50,000 mc. (See chart above.) But even though this upper limit has been gradually pushed back, the need for additional space to accommodate the ever-growing load of world-wide communications has grown much faster. Now the laser, in one jump, has extended the range of useful frequencies tremendously. As Dr. Theodore H. Maiman of Hughes Aircraft put it recently, "The laser jumps the gap from 50,000 million cycles to 500,000 billion cycles, opening the way for a host of important applications." Heart of maser is silver-ended ruby rod, placed in coiled, xenon-filled tube. Narrow Beam. The coherence of laser light is responsible for another useful property: it makes the laser beam far narrower than any previously available. For example, a high-quality military searchlight - the kind used to spot raiding aircraft during World War II - produces a beam approximately one degree in width. One mile from the light, the beam is about 85 feet wide. This may sound impressive, but only until we compare it with the laser beam - which will ultimately be able to illuminate a spot approximately 5 inches in diameter a mile away! Another comparison: the beam from the military searchlight, if directed at the moon, would spread to cover an area 3600 miles in diameter, bigger than the moon itself. But the laser beam would illuminate a spot on the moon's surface less than 10 miles in diameter, without any optical help at all. And one scientist predicts that with a proper setup of lenses, the diameter of the spot could be reduced to two miles! Frequency spectrum, showing new frequency region opened by laser. Note laser's wide operating range. Piping it Through. Of course, like every device, the laser has its limitations. Even the higher microwave frequencies now in use are partially blocked by clouds, dust, fog, and atmospheric moisture. Laser beams, at still higher frequencies, are affected even more. As a result, a point-to-point laser communications link would be put out of commission by fog, or perhaps even by rain. But there are ways of getting around this problem. Bell scientists have already demonstrated that laser beams, like microwaves, can be transmitted through hollow pipes or "waveguides." Thus, communications engineers may simply lay waveguides from city to city and literally pipe through huge amounts of information, regardless of weather or other conditions. What Lies Ahead? As is the case with most new developments, no one knows for sure in just how many ways the laser will turn out to be useful. Dr. Townes predicts that it will push back the frontiers of spectroscopy, revealing further secrets about the basic nature of matter. Distances will be measured with far greater precision than ever before, using Doppler-type radar. And there will undoubtedly be many other as yet undreamed of applications for this newest wonder child in the field of electronics. When will the laser actually go to work? Although it is still in the experimental stage, it should soon be earning its keep. Out at Hughes Aircraft, Dr. Maiman is investigating laser radar. Because of the extremely narrow width of the laser beam, such a radar would be able to pinpoint the location of a distant target to within a few feet, far more accurately than present-day equipment. How great an impact is the laser likely to have on the field of communications? Right now, it's anybody's guess. But those in the field make no secret about the fact that they are tremendously enthusiastic about this new gadget. With usable frequencies already badly overcrowded in many regions of the present radio spectrum, any system that promises to open up vast new chunks of space is something to get excited about. Perhaps the potential role of the laser in communications is best illustrated with a remark made by Dr. R. J. Collins of Bell Labs' laser development team. Said Dr. Collins, "We're not ready to start replacing telephone lines yet. But, "he added with a smile, "we're beginning to think about it."